See clearly at night and help save your life! 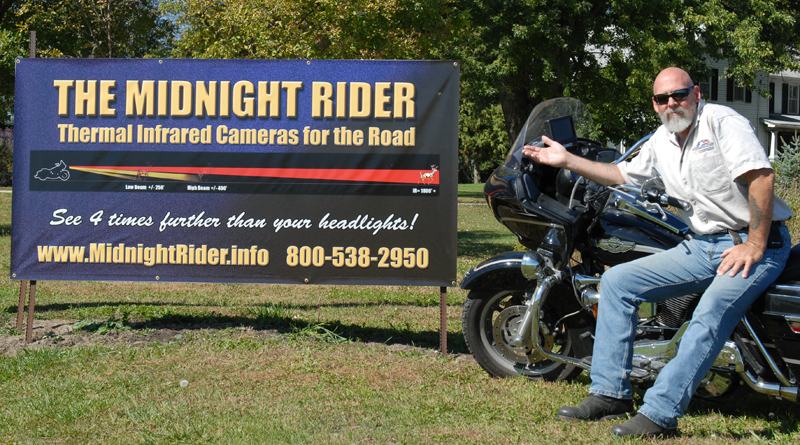 The Sound Co. is now offering FLIR's PathFindIR Night Vision cameras for your Motorcycle! See clearly at night and help save your life! cameras for your Motorcycle, car, truck, boat or semi! Prices now starting at $2450* for the camera and I now also have 7" waterproof monitors available for $299*. *plus applicable sales taxes and shipping. My name is Jim Hirschberg. I bought my first Harley Electra Glide when I was 16 and have ridden many miles, unfortunately not all those miles were enjoyable. I have hit deer 2 different times on motorcycles, once in a car and have had so many close calls with critters I can’t count them all. When I first saw infrared night vision technology I was blown away and just had to have it on my bike, but back then the camera alone was $15000, nearly twice what my motorcyle cost at the time. Well, with time, all new technology comes down in price, gets smaller and gets better. 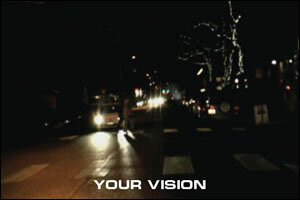 Now is the time for night vision on motorcycles. This technology on a car or truck will save you money but on a bike it can easily save your life! 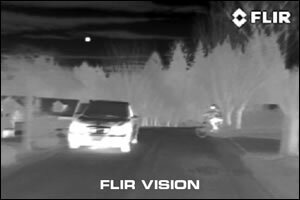 What is Thermal Infrared Night Vision? Our eyes see visible light. With a thermal imager, we see heat. warmer objects appear light and cooler objects appear dark. 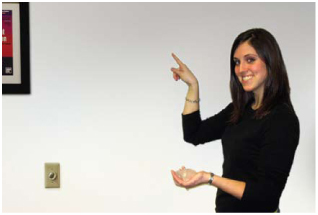 took her hand off the wall. Also notice the ice in her left hand and how dark it is because it's cold. The Midnight Rider is offering 2 camera options to fit your wants and needs. The FLIR Company is a leader in Thermal Infrared technology for the military and private market and I offer 2 different cameras from them. The cameras are small, waterproof, rugged and come with TWO year warranties. The basic PathFindIR has excellent image quality and a wide angle 36 degree field of view and the display is black and white. The Deluxe FLIR PathFindIR camera has some enhanced electronics that allow it to display heat ranges in different colors, it allows the camera to zoom in 2x when you click on your high beams, the image can also be inverted- i.e. hot can be black and cold can be white, and it also allows the camera to be mounted upside down if necessary. Both of the cameras have built in heaters to defrost their protective windows if needed. Thermal night vision infrared cameras let you see clearly in total darkness. Typical headlights only let you see about 450' straight ahead under IDEAL conditions, but Infrared cameras see heat not light, so you can see everything in front of you. Thermal infrared cameras let you see clearly, in good weather and bad, without being blinded by the glare of oncoming headlights. You can easily see hazards in the road more than 4 times further than with your headlights alone. More time to react means you have more time to stop. It's the one thing that can help you avoid traffic accidents. 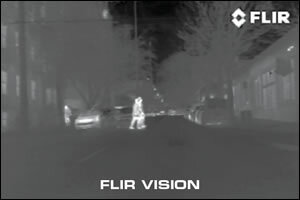 With Thermal Infrared you can see pedestrians, cars, animals, and virtually any other hazard from farther away, or as they approach the road from either side. because headlight glare is invisible to the camera. See many hazards from over four times further away than with the best headlights. See the sides of the road with PathFindIR's wide-angle view. See through dust and smoke. Have more time to react. Avoid accidents, save money and stay alive! but a hit on your motorcycle can easily cost you a whole lot more than money. Avoid just one accident, and a Thermal Infrared camera pays for itself many times over! Many parts of the country are experiencing increased collisions with deer and many people are killed. If you live in deer country, this technology is a must! According to the nations largest insurance companies, the average vehicle repair cost of a deer collision is over $6700, not to mention the possibility of serious injury or death. 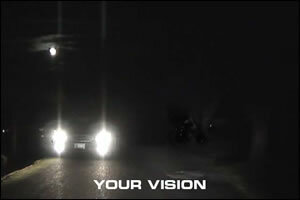 Most other wrecks happen at night, most because of poor visibility. These systems will dramtically cut the odds of an accident. 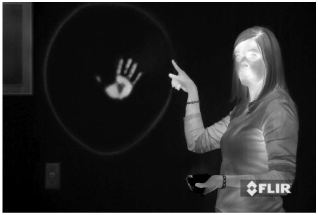 Once you use a thermal infrared camera you'll never want to travel at night without it! I am an authorized dealer for FLIR and handle any warranty issues. demonstrations of the equipment and service after the sale. Installation is also available at my shop at Lohrville IA. The base PathFindIR camera with wiring is priced at $2450 excluding tax and shipping. Mounts/ installation and a monitor are not included but mounts are available for $99 and 7" LCD Waterproof monitors are available for $299. Integration with existing auto video systems is possible- please contact me for availability and pricing. FLIR Systems and Jim Hirschberg d.b.a. The Midnight Rider/ The Sound Co. accepts no responsibility and can not be held liable for any error or accident resulting from the use of thermal imaging systems or errors in the interpretation of the image by the user. 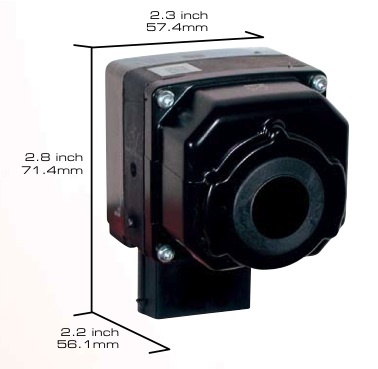 Infrared cameras are a restricted technology and CAN NOT be sent out of the United States. All sales are subject to application and approval of Homeland Security.